To respond quickly to Dirk Deppey’s response to my response to him, I think (and thought then) that we are basically of the same opinion, but I haven’t dropped my quibbly attitude. As far as I could tell from a cursory reading of John Byrne’s rant (and I wouldn’t want to give it more thought even if I were able to think beyond when I can take another decongestant pill and whether I’ll be able to breathe clearly enough to sleep tonight) the entire focus of the argument was on trade paperback collections of mainstream comments “mainstream” comics. Even the passage Deppey quoted, Byrne’s statement that trade-only publishing would be too expensive for companies to handle and have too little return in terms of drawing in new readers, need not be read as talking about anything more than the mainstream “mainstream” comics market. I assume Byrne does realize that people are buying and reading Blankets and Persepolis and that this is just not what he’s talking about. He’s questioning whether I would have paid $20 to buy Batman: Hush , had it been on the shelf beside Persepolis . In this case, he’s right. I, although not John Byrne’s Platonic Ideal Comics Reader, would be more likely to buy a $3 pamphlet or a minicomic to see if I can get a taste for a creator or story before investing more money and time into it. However I’d be even more likely to pick up a promising trade paperback or graphic novel for free at the library, where pamphlets aren’t readily available, and have bought books based on that. This is how I deal with much of my word-only book purchasing as well, since I want to buy books I’ll lend and read again. To get back to Dirk Deppey rather than John Byrne, the point I was trying to make and, I think, didn’t is that different genres (or whatever word you’d like to use) employ different marketing strategies. Graphic novels don’t have to be composed of previously released smaller parts, but that’s one way to do it. I’ve read plenty of novels that began as short stories, or that contain previously published short stories, sometimes because I enjoyed the initial story so much that I sought out the larger context. In choosing the examples he did, Deppey actually gave a good implicit rundown of possible alternate, pamphlet-free routes to the graphic novel, which is what he was trying to do. I just think that they’re not what John Byrne was arguing against, and I was saying that having cartoons in Time or multiple reviews and interviews in The New York Times or a highly acclaimed first graphic novel can be seen as (loosely) functional equivalents to having previous pamphlet stories act as teasers for a trade paperback. I just still don’t think this makes what John Byrne said about mainstream superhero trade paperbacks wrong. I’m fully willing to believe he is, although I don’t know the economic details to know whether he’s right on that front, but I still don’t think the existence and success of graphic novels that appeal to a real mainstream readership, or at least some interested subsegment thereof, as opposed to “mainstream” superhero comics readers is actually a refutation of his argument at all. Dear Readers, I need some quick research help. I want to map out how the X-Men high concept has evolved since its beginning, but I don’t want to have to buy and read every X-Men book ever—I just need the highlights. The only X-books I’ve read are New X-Men and X-Statix , so I’m look for other books of interest w/r/t the evolution of the X-Men high concept and the metaphors used in X-books. By “evolve,” I don’t mean “improve,” I mean “adapt to its current context.” E.g., the X-Men began as the Children of the Atom, I believe with the implication that mutation is caused by atomic radiation (surprise, everything is caused by radiation in that era of Marvel). How has the portrayal of mutation changed over the years? And just as importantly, are there stories (preferably ones available as TPBs) that exemplify various stages of the evolution of the mutation concept? I know I should look for the Marvel Masterworks or Essential X-Men . I’m also interested in the evolution of the metaphors in the X-Men. We’ve discussed that some already on the blog, w/r/t race, feminism, geek pride, more general political metaphors. Anything else interesting I might look out for? Are there 1960s-era stories that are especially metaphorically interesting? 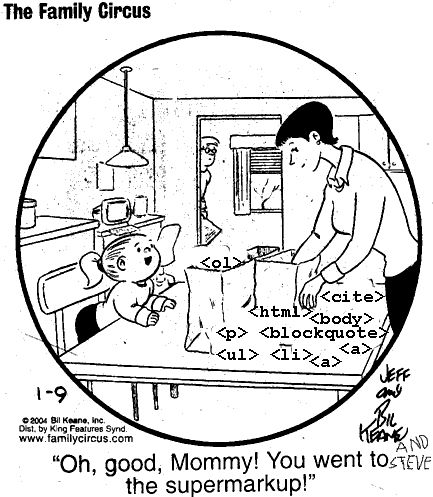 Yes, that is the actual caption on today’s Family Circus . Is it a joke about supermarkets marking up their prices? I do not know. Now it’s an HTML joke, go me. Thank you, Steven Wintle : Wonder Woman #246 is on my must-find list! 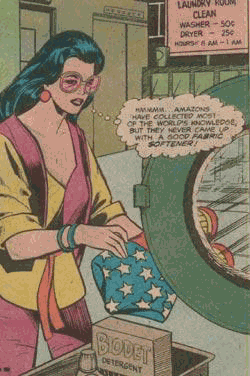 The Amazons don’t have good fabric softener! Who wrote this brilliance? Jack C. Harris . Sue Storm has a boy head! John Jakala brings tidings of ugly manga art from Marvel. Mr. Fantastic is Billy Bob Thornton flashing gangsta-rap hand things! Now, the idea behind the Marvel Age is to republish 1960s-era Marvel stories with new manga art. At least Marvel is being honest now about their creative autophagy.